An Act Of Kindness: Photo Of NYPD Officer Giving Barefoot Man Boots Goes Viral : The Two-Way On a frigid November day, the 25-year-old officer bought new boots for the barefoot man. A tourist captured the moment on camera and it's become an Internet sensation. Everyone agrees, there's not enough good news in this world. Today, Newsday and The New York Times have focused their attention on the story behind a heartwarming image that has been shared almost 350,000 times on Facebook. It shows Larry DePrimo, an New York Police Department officer, kneeling next to a barefoot man in Manhattan, a pair of fresh, new boots at his side. "I had two pairs of wool winter socks and combat boots, and I was cold," DePrimo, 25, told Newsday. He asked the man if he wanted a pair of shoes and some socks. The man told him he'd never had a pair of shoes, so DePrimo went to a Skechers store and bought a $75 pair of "insulated winter boots and thermal socks." "It was like you gave him a million dollars," said DePrimo about the unidentified man. The photograph was taken by Jennifer Foster, a tourist from Arizona. She witnessed the act of kindness and sent the department the picture and the story. "The officer expected NOTHING in return and did not know I was watching. I have been in law enforcement for 17 years. I was never so impressed in my life. I did not get the officer's name. It is important, I think, for all of us to remember the real reason we are in this line of work. The reminder this officer gave to our profession in his presentation of human kindness has not been lost on myself or any of the Arizona law enforcement officials with whom this story has been shared." The department put it on their Facebook page and the rest, as they say, is history. We'll leave you with a couple of more details from The New York Times: The owner of the Sketcher's store gave DePrimo a 25 percent discount and DePrimo, who lives with his parents on Long Island, has kept the receipt in his vest — "to remind me that sometimes people have it worse." Update at 7 a.m. 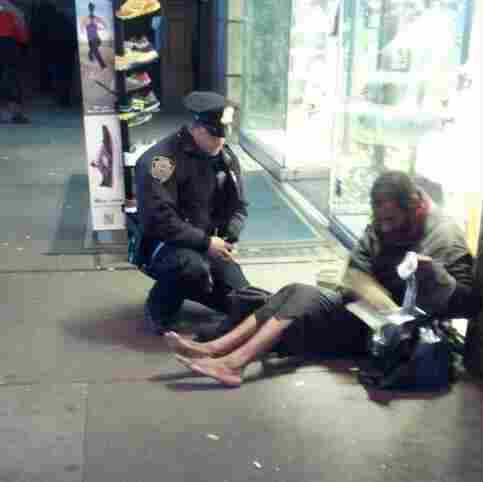 ET, Dec. 3: "Homeless Man Given Boots By NYC Police Officer Chooses To Go Barefoot Again." Update at 2 p.m., Nov. 30: Courtesy of The Associated Press, here's video of DePrimo talking about what he did.